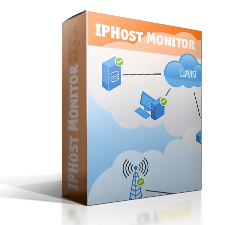 With IPHost Network Monitor you can monitor availability or performance for any web server, website or web application. 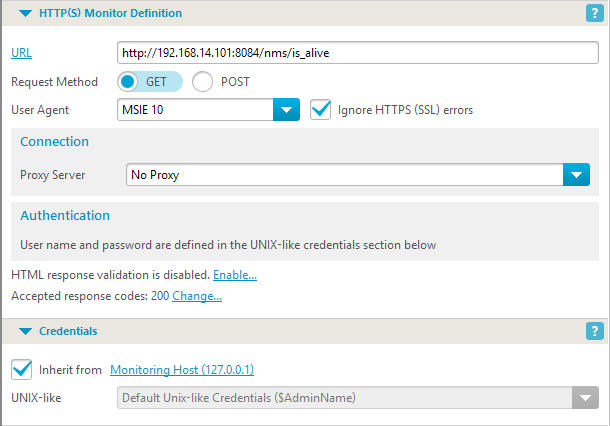 HTTP monitor can check any URL you provide, this internet/intranet monitor supports secure connections using SSL (HTTPS), can perform POST requests. All types of proxy servers are supported so you can monitor hosts via proxy if it is required. Several authentication methods are supported including Basic and NTLM (Windows Integrated) authentication that is critical for monitoring a large number of web sites and web applications. For more in-depth checks you can use content validation, IPHost Network Monitor searches for a string in downloaded content and you can choose should the content match the string or not. You can also do performance monitoring of your critical web and intranet applications. IPHost Network Monitor collects page response time and you can set two performance problems levels and corresponding actions/notifications for them. Performance Warning level usually tells you that some performance problems appear, Performance Alert level you should use to signalize about more severe performance problems that should be resolved immediately. In conjunction with PING or similar monitor, the above is enough to make sure a Web site page is loaded and contains whatever text you expect. A Web site nowadays is a complex entity, its normal operation depends on how a number of other services interact. To get more detailed information on a site’s health, one should use a number of monitors, below is a typical use case. DNS monitoring. Make sure the site’s domain name(s) indeed resolve to expected IP addresses. To achieve that, create DNS monitors for your site’s names. That would alert you not in case of DNS servers inefficiency, but also in case of domain DNS records unexpected change. HTTP(S) monitoring. Use several HTTP(S) monitors to make sure important site pages are loaded as expected. If site expects authentication to reach certain areas, you can also use Web Transaction monitor to emulate user’s authentication and further actions. FTP monitoring. Although insecure and out-of-date, FTP protocol is still used to upload data to the site. You might need to create a FTP monitor(s) to make sure this is functional. DB monitoring. Most modern sites do use a SQL database to store and retrieve data. Thus a DB (MySQL, PostgreSQL etc) monitors could be useful. Note: under normal circumstances, DB access to outside clients is not configured. Make sure you allow the IPHost Network Monitoring client to access database(s) with lowest possible privileges account (if insecure connection is used to communicate, this monitor could constitute itself a security beach for the site in question). Mail monitoring. Although email services are not directly related to Web site health, they might be used, for example, to notify site owner, moderators etc. of any significant event. Make sure the mail service works reliably by creating appropriate monitors (for both accessing mail and for sending it). File size monitor. Certain site areas could contain crucial files (such as configuration files) required for proper site functioning. Monitoring these files could be an early warning against possible site unauthorized access and of similar problems, thus allowing to react quickly in case site files have been changed unexpectedly. Note: make sure you configure properly secured access to get file sizes information. External program or script monitoring. When everything else doesn’t work, you can always create a custom program or script and use the corresponding monitor type to run the program/script. This allows to receive any type of information from the site and at times can be more secure than probing, say, file size directly. 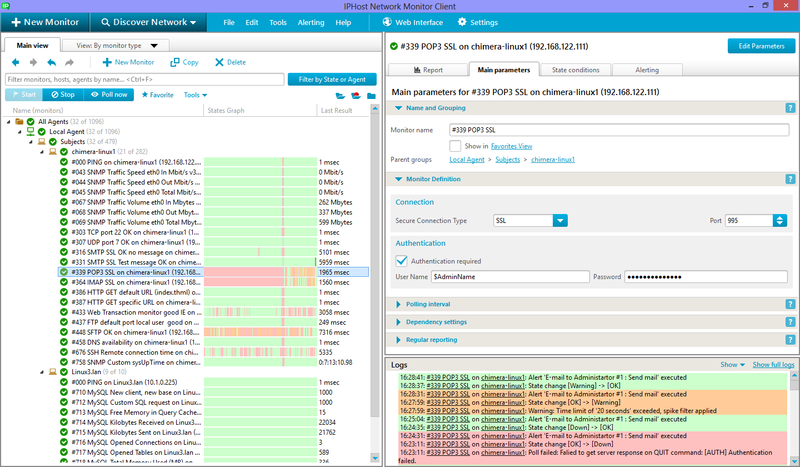 Server hardware parameters monitoring: CPU load, disk usage, etc. Note the general rule: always use the most simple monitors wherever possible, since monitors are expected to watch site health, not to clog it with frequent requests. 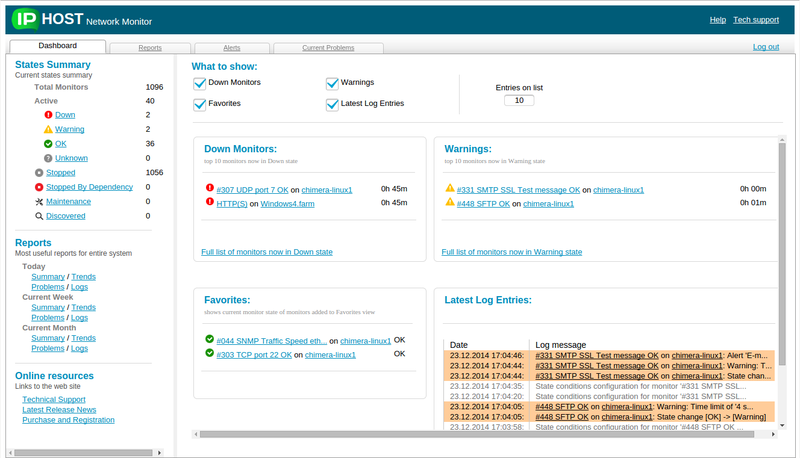 Free 30-day trial version of IPHost Network Monitor is available. During your trial you can get support by e-mail, please use contact form to send all your inquiries on IPHost Network Monitor features and purchase. Download the free trial of IPHost Network Monitor and start to monitor your network and vital applications in a few minutes.